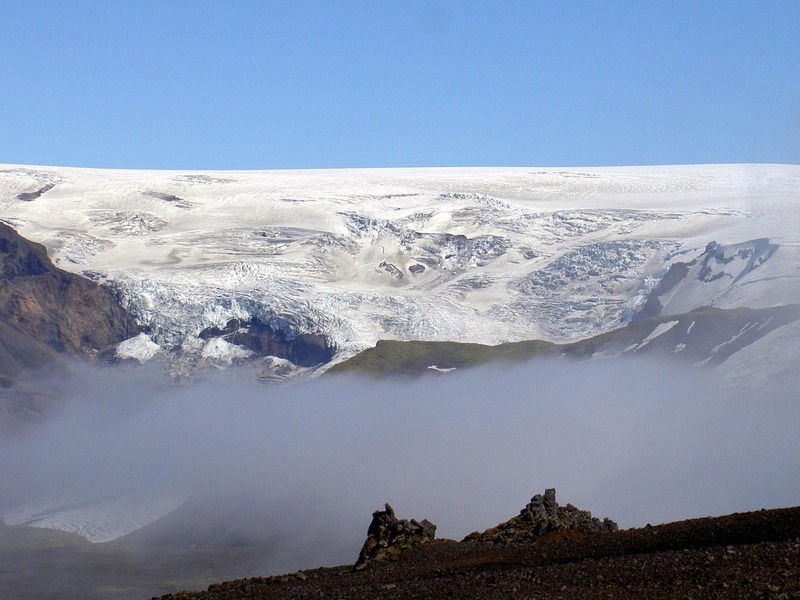 Could a Major Eruption -Like Katla, Iceland’s “Big One”- Reverse Global Warming? Advocates of hacking the planet via "geo-engineering" to cool the Earth to offset the effects of greenhouse gases–suggest that major volcanic eruptions such as Iceland's currently quiet Katla Volcano could be the answer. This sounds powerfully like one of those "beware what you wish for" scenarios with profound unintended consequences -economic and otherwise, as Europe just discovered from the eruption of the Eyjafjallajökull volcano, Katla's interconnected sister. Massive eruptions, like the one at Mount Pinatube in 1991, actually did cool the planet by injecting sulfates into the upper reaches of the atmosphere, where they circulated for over a year. Pinatube produced the second largest terrestrial eruption of the 20th century (after the 1912 eruption of Novarupta) and the largest eruption in living memory with effects of the eruption felt worldwide. It ejected roughly 10 billion metric tons (10 cubic kilometres) of magma, and injected large amounts of aerosols into the stratosphere—more than any eruption since that of Krakatoa in 1883. Over the following months, the aerosols formed a global layer of sulfuric acid haze. Global temperatures dropped by about 0.5 °C (0.9 °F) along with ozone depletion substantially increased. Advocates have been hoping that another major eruption would come along that could be studied for clues on how best go about artificially cooling the planet. The eruptions of Iceland's Eyjafjallajökull volcano, while impressive and large enough to shut down air traffic in Europe, was just a lower atmosphere event , where the lifetime is on the order of one week, only emitting less than 0.004 Mt of SO2, compared to the 20 Mt that the 1991 Mt. Pinatubo eruption injected into the stratosphere -a minor preview of the havoc this hairbrained geo-enngineering dream would wreck. To make an impact globally, the geo-engineered volcano nightmare would have to erupt much more violently -or perhaps trigger nearby volcanoes to erupt violently as is predicted for Katla-so that the larger amounts of sulfates would reach the stratosphere and remain in place. Casey Kazan via MIT Technology Review.